Things weren’t looking so good for Urban and Community Forestry (U&CF) programs when President Trump unveiled his 2018 budget zeroing out funding. But the House of Representatives has picked up the pieces and allocated $27.3 million to support the health of our nation’s urban forests. That’s a handful of sawdust relative to the overall $4 trillion budget, but welcomed nonetheless by the agencies throughout the United States and its territories. Continuation of U&CF funding still requires support of the U.S. Senate. As you can read in this month’s Illinois Urban Wood Update, the Sustainable Urban Forestry Council and the National Arbor Day Foundation’s Alliance for Community Trees Program have been rallying support to lobby the Senate to maintain funding. You can also watch an on-demand webinar explaining what’s at stake and how to get involved. 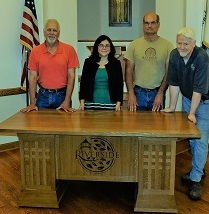 Speaking of involved, the Village of Riverside showed its support of the Chicago area’s urban wood movement. Village officials gave their blessing to have a 160-year-old oak tree downed in a March storm repurposed into a trio of desks for the village hall. Kudos to Riverside Forester Michael Collins for seeking and winning the support of elected officials. I had a chance to meet with Michael, Dan DeSerto of Bull Valley Hardwood, which milled the log, and Paul Meyers of Woodstock Woodworks, who expertly crafted the pieces. I’ll be writing a story for a national woodworking trade publication for the time being, check out the Riverside-Brookfield Landmark’s report. Need a break from reading? Check out the video that shows how Indy Urban Hardwood utilizes its portable sawmill to salvage fallen and diseased urban trees in Indianapolis. It’s Episode One of Wood-Mizer’s new Urban Sawmill series. And don’t forget to send us your urban wood news, stories, events and more.